So what can you expect from this issue? Well, we have a lovely potpourri of ideas and inspiration covering babies and toddlers to matriarchs and patriarchs and everyone in between. It could be you have a Cheeky Little Monkey to make a card for, of any age! Perhaps you feel like sending a greeting via a Typewriter, some great, fun ideas to try. The Spinning Charms are just enchanting and make the most appealing cards. We have had so much fun putting together the characters using Bella’s Wardrobe dies. Or maybe the splendour and dignity of The Ultimate die, gets your crafting juices flowing. We have three fabulous projects for you to try. All very majestic and perfect for those very special events. I also want to mention the Charisma Daisy die, a brand new concept for Tattered Lace. Just use the complimentary “decoupage sheet” and cut with the Charisma dies for effortless decoupage. Of course you will get your rather lovely FREE papers as usual and they are definitely up to the high standard that we like to keep. Talking of FREE, not one die this time, but four!!! Four very pretty and ever-so-useful, go to Border dies. They are perfect for adding a hint of broderie lace to your projects. They will repeat beautifully and are perfect for making lacy mats. 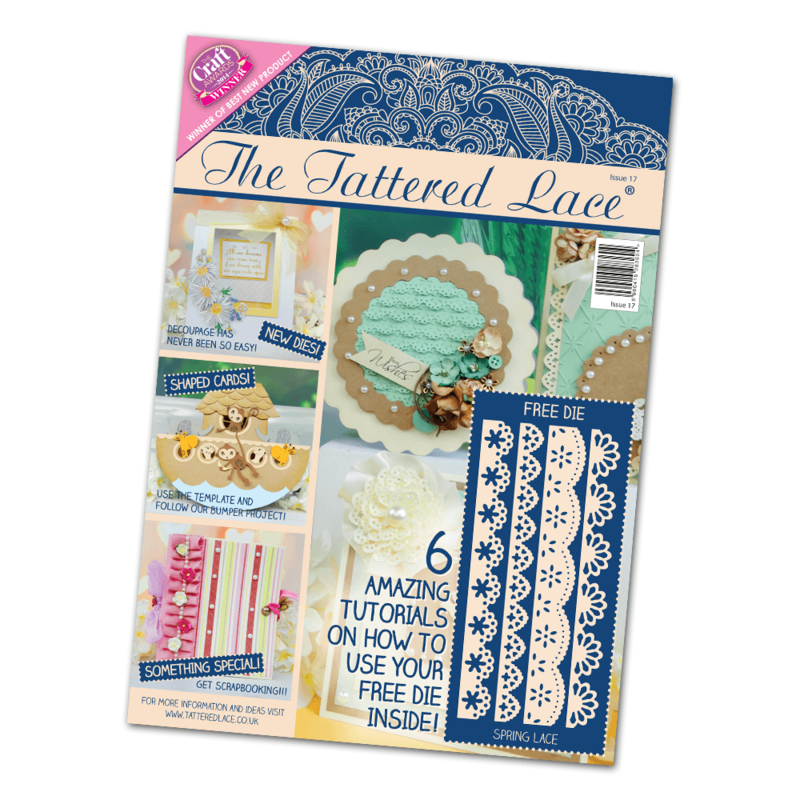 A perfect addition to your crafty arsenal!